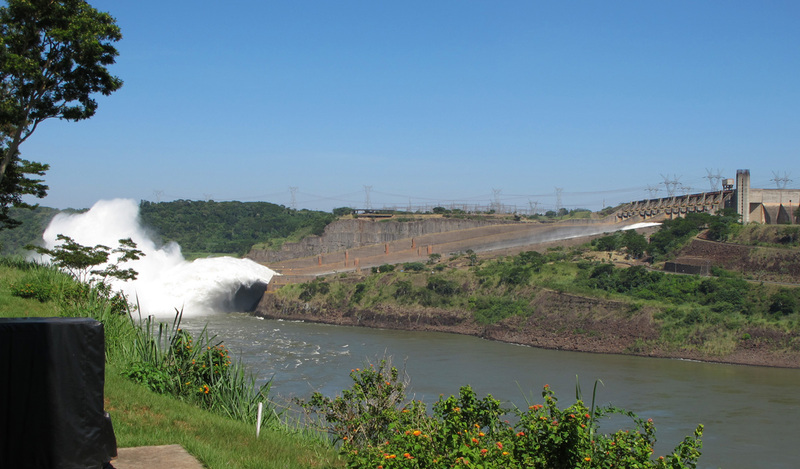 I caught a local bus out to the visitor center at the giant Itaipu (“it-eye-poo“) dam on the Brazil-Paraguay border. Depending how you measure it, this is either the #1 or #2 hydroelectric plant in the world, with a peak generating capacity of 14 Gigawatts. Yowza! 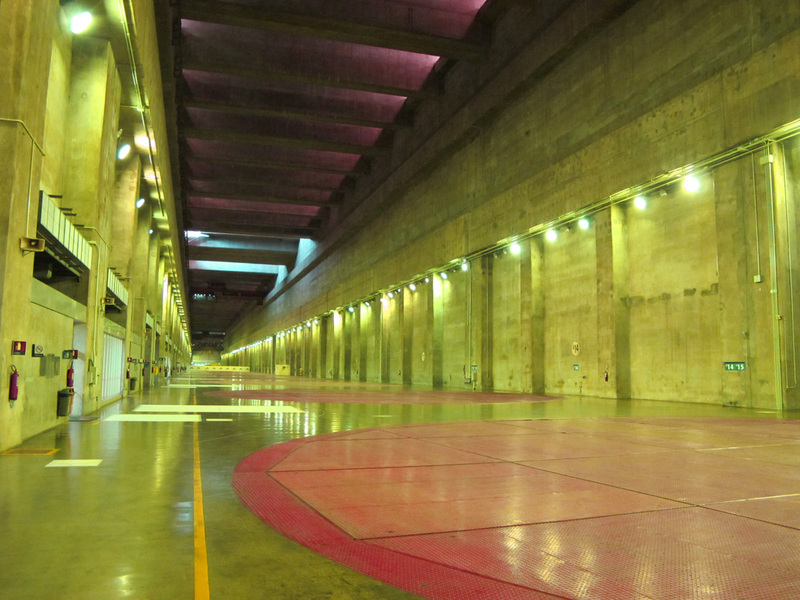 I signed up for the “Special Circuit” tour, which actually goes inside the dam. We watched an introductory video, which included lots of eco-friendly chit-chat about how the dam companies are funding various worthy local initiatives. This all seemed fine, but rather distracting small potatoes stuff compared to the great dam itself! There was tight security on the tour. We weren’t allowed even small bags, and we were each hand scanned before boarding the bus. In theory shorts and exposed toes are forbidden for safety reasons, but our guides tactfully overlooked several short and sandal clad visitors. We were lucky, some of the spillways were open. (This only happens around 10% of the time.) There was a pretty serious volume of water going through, and at high speed. Our guide told us that the current flow rate was 7.8 million litres/sec (7,800 m3/sec) . Yikes. The spillways are designed so that at the bottom there is a very hard wall which cause the water to shoot up and away from the end of the spillway, to reduce erosion under the exit. Each of the gates is 20m wide and several were open. 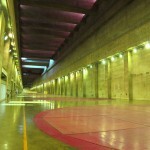 One difficulty in photographing the dam is conveying a sense of scale. It’s all ****ing enormous. 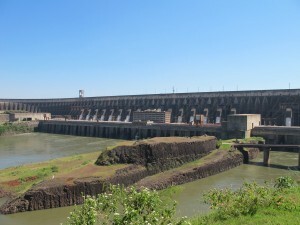 The overall dam length is 7km. When we were there, the spillways were firing out several times the average volume of Iguazu Falls. 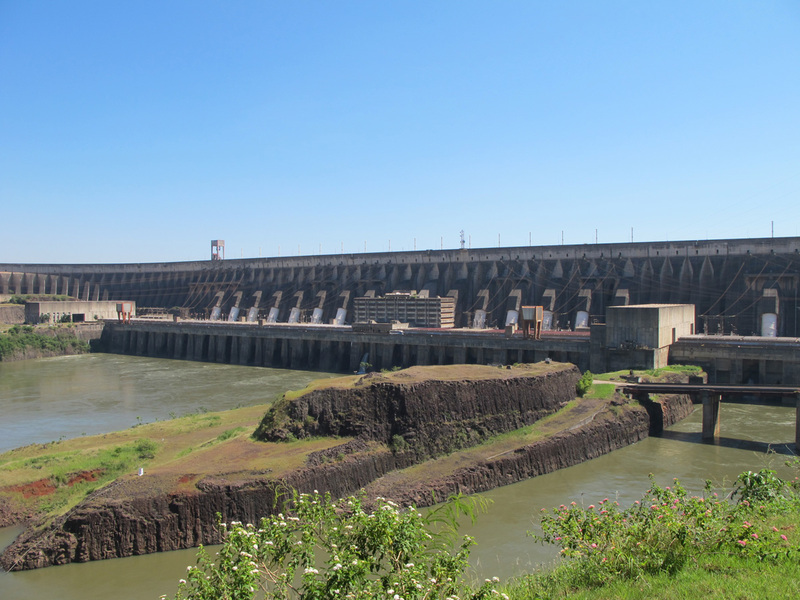 We drove along the top of the dam and stopped for photos of both the Parana and spillways downstream, and the giant lake Itaipu upstream. 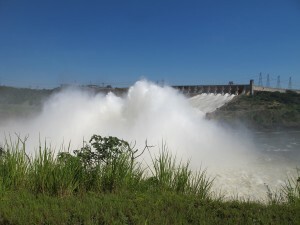 I thanked the mighty Rio Parana for graciously sharing his power. Inside the dam, we had to wear hard hats. We were shown an internal open shaft running all the way down (100m?) to the original river bedrock. 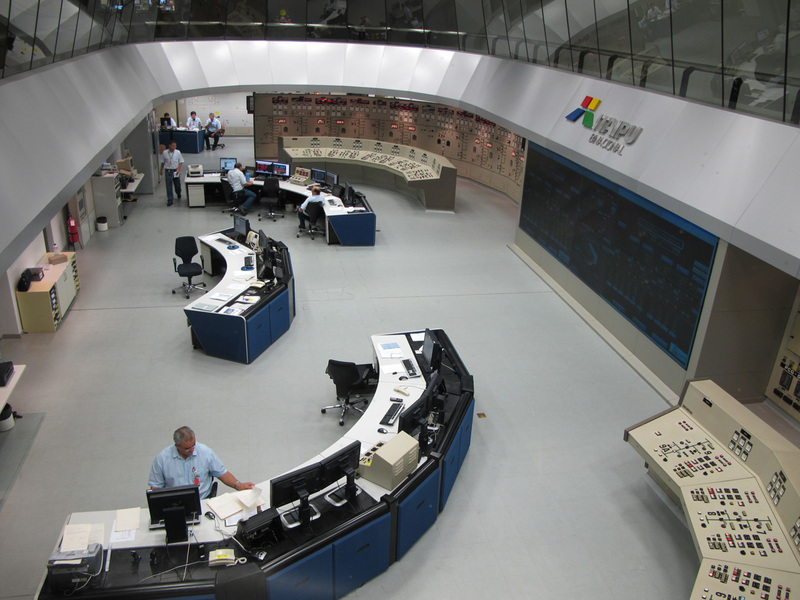 Then we were taken to a viewing gallery over the main control room, with its staff of 5 Brazilians, 5 Paraguayans and (on alternating shifts) either a Paraguayan or a Brazilian chief. The international border runs down the middle of the room. 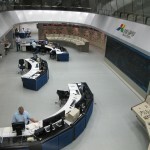 Then we were taken to the giant Generator Hall, which we were told is 1 km long. There isn’t much to see there, just giant red covers on the floor over the generators. 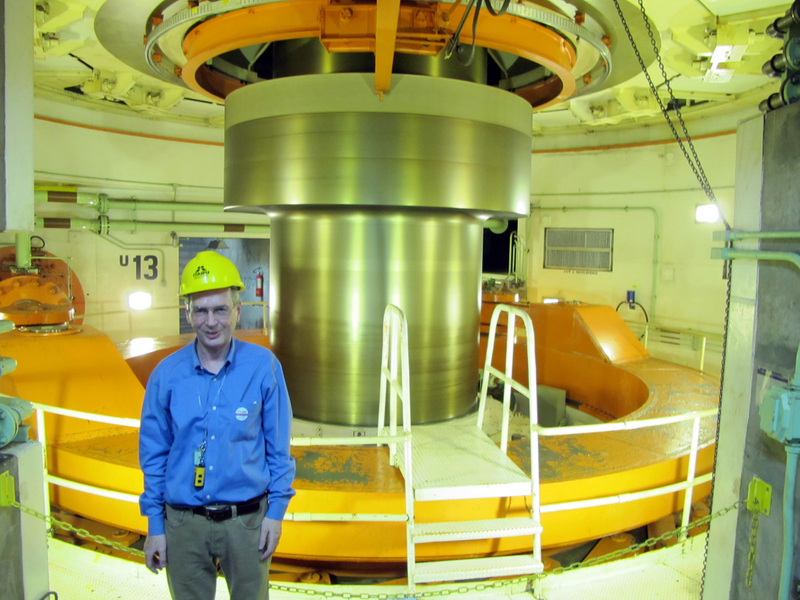 For the finale we were taken down to see the rotating vertical shaft of a generator. 700 Megawatts of rotating steel just a few feet away! Right now over 90% of the energy is going to Brazil. They generate at different frequencies (50 Hz or 60 Hz) for the two countries. Our guide was careful to explain that everything is handled evenly between the counties. However, Brazil seems to have been the main driver in the construction and is the main power consumer. And they built and run the visitor centre too. This was a really great tour! If you’re visiting Iguazu, don’t overlook this.